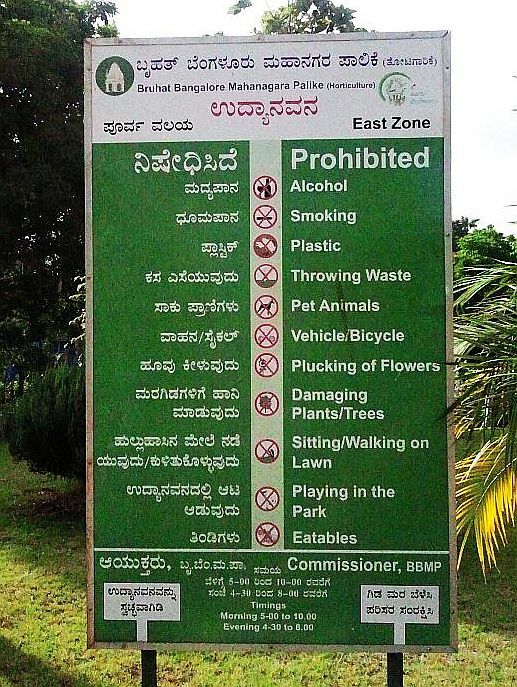 Bangalore is a city of parks. These are important public spaces of recreation where children come to play and adults to exercise. Walking seems to be the preferred form of exercise in India. 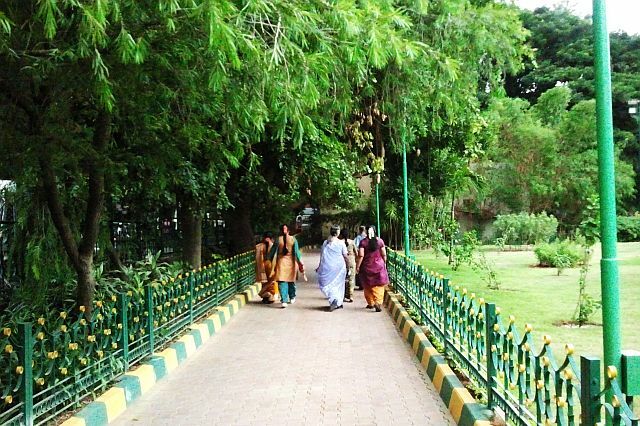 Every morning and evening people go to specially designed neighbourhood ‘walking parks’ for their daily power walk. These green spaces seem necessary because taking a stroll on the city’s streets is not easy. Pedestrians often have to walk on the road because there’s not always a sidewalk or footpath to walk on. Then there are many obstacles to negotiate: broken sidewalks, construction material blocking the way or vendors taking up the space with their carts. Also, heavy traffic makes it difficult to cross the road. So walking parks offer a pleasant place to walk freely and unhindered and get some exercise. Sometimes I like to take a walk in the park myself. There are four public parks within easy walking distance from where I live. I go to either the lovely and lush park in posh Defence Colony, or to another smaller park close by, in a more middle-class neighbourhood. Despite their proximity, these two parks are a world apart. Defence Colony park is quieter – there are fewer people and most of them wear Western-style clothes like tracksuits and running shoes. I hear them speaking mostly English to each other or on the phone, but also in Kannada. At the other park, the scene is different. It’s a lot busier, there are more ladies than men, and no tracksuits are to be seen here. Most of the ladies are wearing saris, while some are in salwaar kameez. Some wear running shoes for their power walk, but most wear their ordinary everyday chappals. I’ve also seen some making their rounds in men’s house slippers! The chatter I hear around me here is in Kannada or Tamil. Parks have rules… of which there are many. These parks are for serious walkers, so playing is not allowed and walking on the lawn prohibited. Forget about having a picnic, ‘eatables’ are not allowed here, and needless to say, neither is smoking or drinking. And make sure you walk in the right direction – clockwise only! Parks are open during set times for a few hours in the morning and again in the evening. Outside these hours, they’re closed to the public. It seems strange to me that they should not be open throughout the day, but there must be some logic to this that I’m not aware of. It’s thanks to these many green spaces that the city’s residents can get their daily dose of exercise. 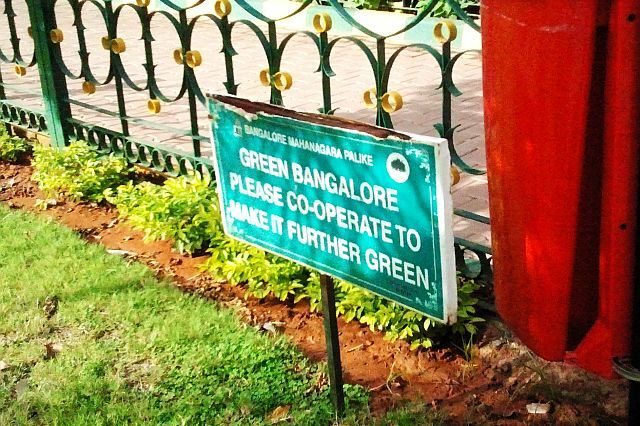 Bangalore’s old moniker, the ‘garden city’, still rings true. Ha ha! I feel robbed. 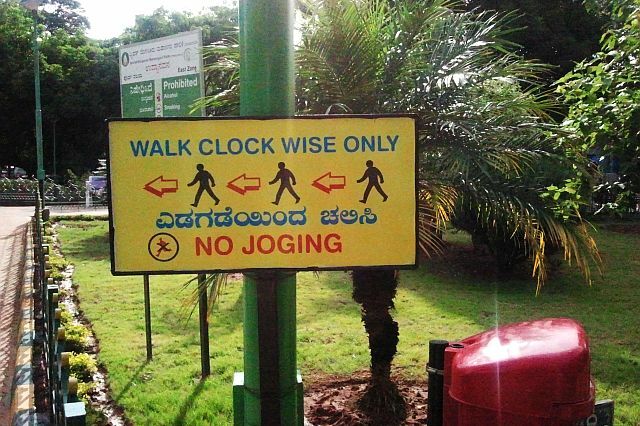 This is the first I've heard of this hotbed of Bangalore walking action. Curses! I live out in Whitefield and we have none of this walking park business there. Oh to be in the city for this - the single thing I miss most of all in India is being able to go for a proper long walk without risking life and limb playing in the traffic. More power to your walking shoes. And I must make plans to walk with the masses soon. Thanks for the heads up. Hi Liz, sorry to hear about your plight in Whitefield! I know that people who live in apartment compounds take walks around their compound instead of parks! But of course it's a lot nicer to be under the trees.